Rumour No. 1: Carlo Ancelotti is looking to spruce up his defense in the summer and may turn to Benfica defender David Luiz to reinvigorate his ageing backline. Chelsea are the latest in a long line of clubs to be linked with a summer move for the 22 year old (who is rated at around £10 million) but The Blues may face stout competition from Manchester United, who are also notably keen on the Brazilian. Rumour No. 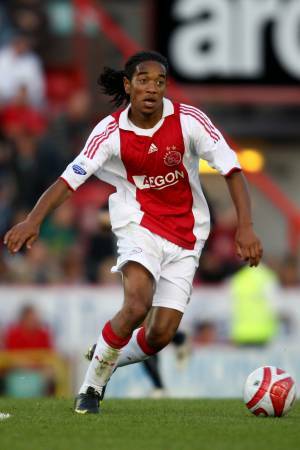 2: Tottenham Hotspur are monitoring Urby Emanuelson‘s situation at Ajax, as the Dutch full back is apparently becoming increasingly frustrated by the lack of contract negotiations being offered to him by the Eredivisie giants. The Best of the Rest: Manchester City are set to duke it out with Juventus over Real Madrid’s Gonzalo Higuain in the summer, should the Argentinian striker decide to leave the Bernabeu. Blackburn Rovers crock Steven Reid is to join Sheffield Wednesday on loan until the end of the season to gain some much-needed match fitness. Sunderland are keen to rush through a deal for Cruz Azul’s Cristian Riveros before the World Cup starts in June. Habib Beye has threatened to quit Aston Villa if he doesn’t get more first team opportunities. Bye then! Everton legend Andy Van Der Meyde has joined PSV on a free transfer. The Dutch winger managed 20 games in four years for the Toffees (no goals scored, in case you were wondering). Kilmarnock striker Kevin Kyle (formerly of Coventry City if memory serves) is to have trials with Russian outfit Spartak Nalchik – which sounds suspiciously like something out of ‘A Clockwork Orange’ to me.